Seeing double: Vaudeville-themed Comedy of Errors is full of slapstick fun – but what about the women? 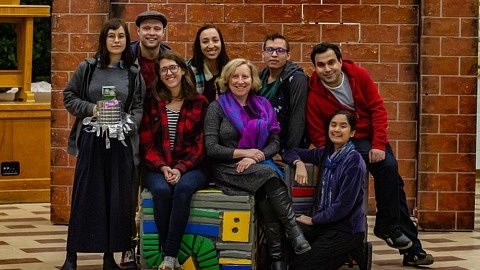 Director Daryl Cloran puts a vaudeville twist on a Shakespearean classic in Theatre Aquarius’ production of The Comedy of Errors. 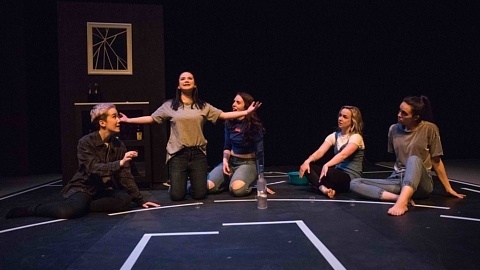 A talented cast serves up some stage magic with a dash of slapstick comedy, but misses the mark when it comes to the representation of some female characters. The Comedy of Errors follows the story of Egeon, a merchant of Syracuse condemned to die in Ephesus for violating the ban against travel between the two rival cities. He tells Duke Solinus that he has come to search for his wife and one of his twin sons, separated from him 25 years ago in a shipwreck. The other twin, who grew up with Egeon, is traveling the world to search for the rest of his family with his slave Dromio (who also has a twin named Dromio serving Egeon’s other son). The Duke grants Egeon one day to raise the money that will set himself free. Unknown to Egeon, his son Antipholus of Syracuse (and slave Dromio) have stumbled onto the docks of Ephesus—where his missing twin, known as Antipholus of Ephesus, is a prosperous citizen of the city (confused yet?). What follows is a series of comedic and mind-boggling encounters that all culminate in the inevitable revelation of truths. 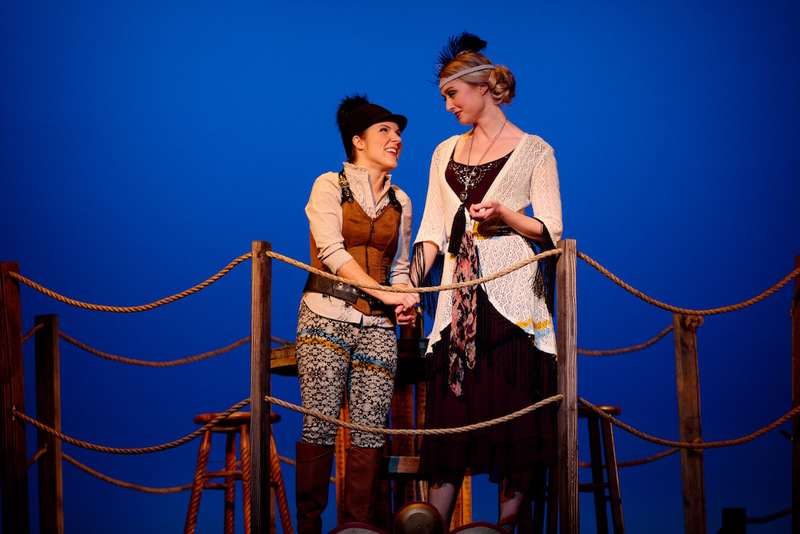 In Theatre Aquarius’ version, several of the characters, the set, and costumes have been revamped with a 1920s vaudeville approach. Antipholus of Ephesus (Jamie Robinson, who of course also plays his own twin brother) is a magician and entertainer with high standing among the citizens of the town, while Duke Solinus is now The Duchess (Tess Degenstein) who acts as a ringmaster of sorts, running this town full of performers. 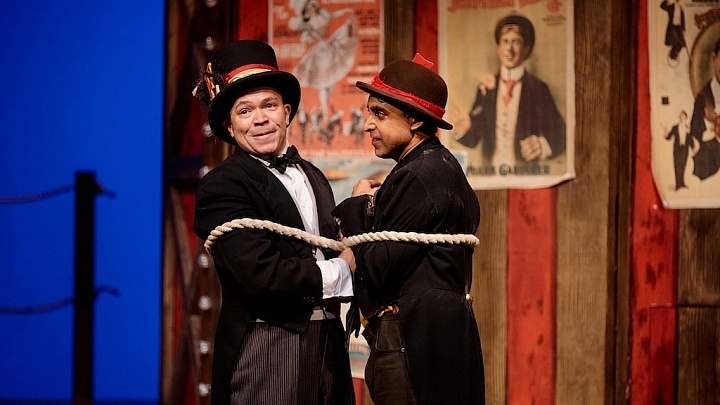 The vaudevillian take was a creative and fitting choice for this show’s content—the slapstick stage combat combined with certain character tropes, such as the bumbling police officer, added a fantastic over-the-top edge to this comedy full of mixups and misunderstandings. 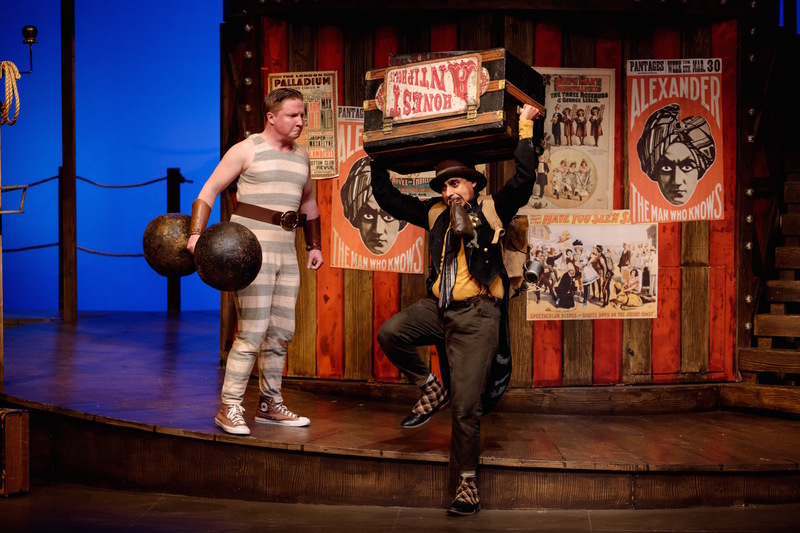 Set and costume designer Drew Facey has created a wooden masterpiece resembling both a dock yard as well as a carnival stage—from trap doors, walls rigged to have knives spring out, and a large drum-shaped riser used to mask costume changes as well as provide playing space, the dynamic set had me starstruck. Anand Rajaram as Dromio of Syracuse. Photo by Barbara Zimonick. Anand Rajaram, who plays both Dromios, was clearly in his element—the actor’s physicality, voice, and range of locomotion reminded me of Charlie Chaplin. From pulling off hilarious stage acrobatics, making an empty trunk seem like it ways a ton, and the classic vaudevillian chase scenes—I couldn’t take my eyes off Rajaram. The dazzling costumes played a huge role in much of the comedy and put gender roles into question. Facey illustrates each character’s place within Ephesus—an example is Adriana (Degenstein), wife of Antipholus of Ephesus, who is dressed as a flapper, hair worn short with a simple feathered headband, and a free-flowing three-quarter-length mauve dress with a long necklace. She paints a picture of upper class and wealth. On the other hand, her sister Luciana (Ella Simon), a chemist and the mechanic of Antipholus’ magic tricks, is Adriana’s complete opposite, wearing brown knee-high boots, white button-up chemise with a high frilly collar, and brown zip-up bodice that communicates her profession as well as her spunky nature. Ella Simon (Luciana) and Tess Degenstein (Adriana). Photo by Barbara Zimonick. I applauded Cloran and Facey’s choice to make Luciana a mechanic, subverting traditional portrayals of Shakespearean women—in the original text this character isn’t given much agency other than being Adriana’s unmarried sister and the object of Antipholus of Syracuse’s affections. 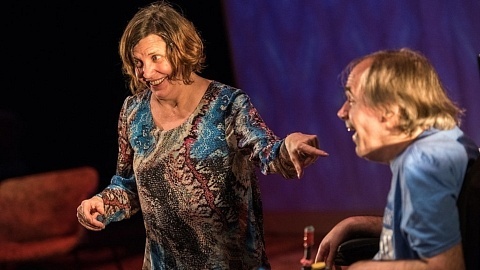 Though Simon’s portrayal of the character begins soft-spoken and humble, the actor infuses her character with a hidden fire that reveals itself in her Act 3 monologue as she commands Antipholus OS (thinking he is Antipholus OE) to hide his unfaithful affections. Under the expert direction of choreographer Tracey Power, Robinson and Rajaram performed a little stage magic of their own in the final scene. As the actors enter with either a green or red ribbon and either a E (Ephesus) or S (Syracuse) to indicate which twin was present, I wondered how they would pull off having both sets of twins on stage at the same time. In true vaudeville fashion, the ending dance number featured several of the characters represented by their hats, animated by the actors’ hands as if a person were standing beside them. The actors’ investment in their character physicality and obvious knack for physical humour had me in awe. Andrew Cownden (Angelo), Jamie Robinson (Antipholous OE), and Tess Degenstein (Cop). Photo by Barbara Zimonick. Though the spectacle and vaudeville theme made for a highly entertaining evening, the representation of some female characters was questionable. I was particularly unsettled by Degenstein’s playing of Adriana—though the character was driven, passionate, and not afraid to speak her mind, I found the hyper-feminine, damsel-in-distress caricature patronizing and was confused, considering she was dressed as a flapper. I understand the flapper movement as a declaration of independence by women from a male-dominated society, and the reclaiming of quote-unquote traditionally male activities. Whether it was the director’s vision or an acting choice, I often found myself shaking my head and wondering why some form of intervention into this character’s dialogue or the performance style wasn’t made. 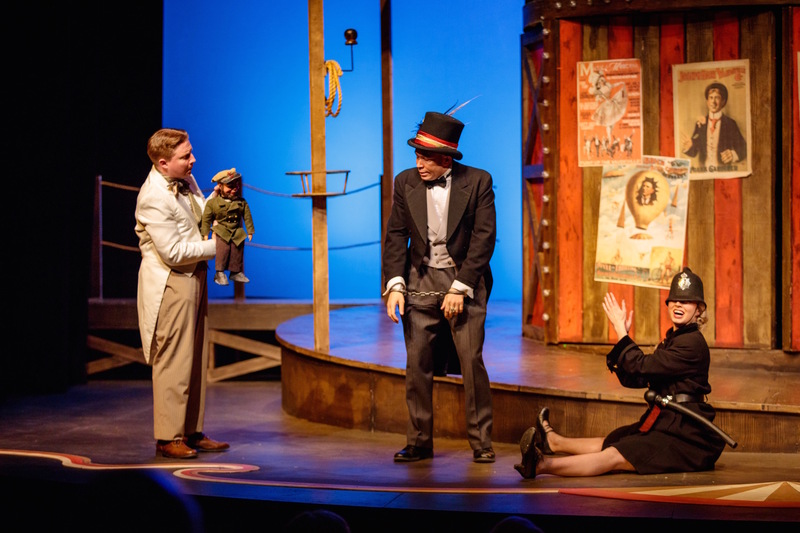 Theatre Aquarius has proven that vaudeville is far from dead with this revamped production of The Comedy of Errors. I oooed and aahhed at the striking physical work of the actors, the hidden wonders of the set, and the action-packed slapstick moments—but left the theatre pondering the problematic portrayals of women in Shakespeare, and why the text wasn’t revamped to engage in a dialogue more in tune with current conversations about gender and sexuality. I thoroughly enjoy reading your reviews as it grabs my imagination and makes me feel as if I were there watching the performance!